This week I was reminded about how fun it is to teach kids how to do paper quilling! 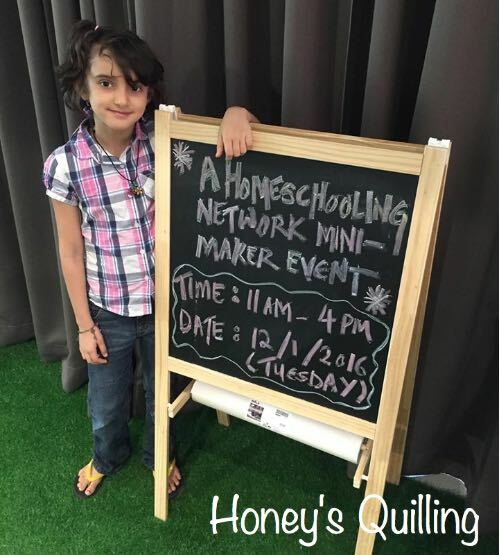 Here in Malaysia there is a great homeschooling community. I don’t actually make it to a lot of the events as I don’t drive here, but sometimes my husband is available so we all go together. This event was one I didn’t want to miss! It is called a Makerfest, and basically anyone was free to have a table and display/show something that they make. 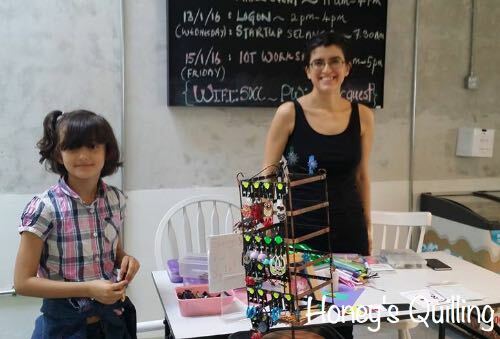 There were tables for jewelry, hamster playgrounds, minecraft, rainbow loom, and so much more! Of course Svara and I chose to have a paper quilling table! 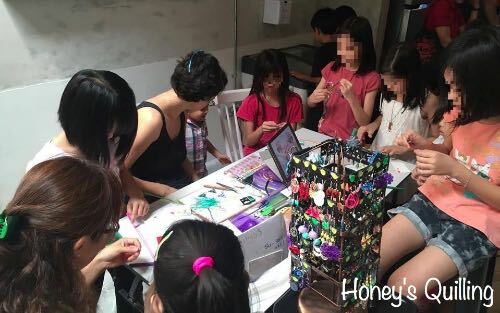 We brought along some of our handmade quilled jewelry to sell, and we had paper strips , slotted quilling tools , and colorful blank gift tags available for those who wanted to learn paper quilling. And boy did they want to learn! Here we are setting up our table! Svara had the job of hanging up all of the earrings. I have had this stand for quite a few years now. I like how many earrings it holds and that it spins around! 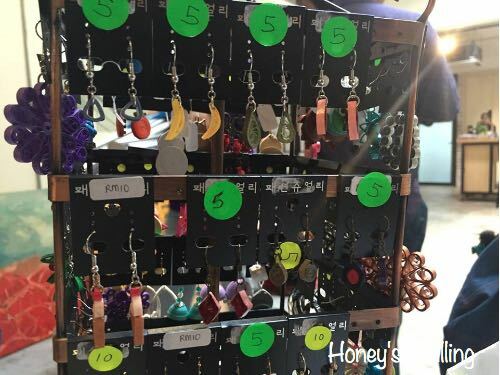 These two top rows of earrings were the ones that Svara made. I’ll be taking some better photos of them this week and getting them up on the blog. Here they are a bit hard to see with the other earrings in the background. All set up! I had my iPad Air 2 in the front with a slideshow of some of my other quilling work such as frames, fancy jewelry, tutorials, magnets, etc. I guess this photo is after the main setup, I can see that the papers are already out and cards are messed up a bit. My three year old daughter is very reserved when in crowds, but she had fun at this event as well. Some ladies came over and were looking at the earrings and my daughter was tapping the table next to the “party hats” that she made, so that they would take notice of what she had made. It was so cute! 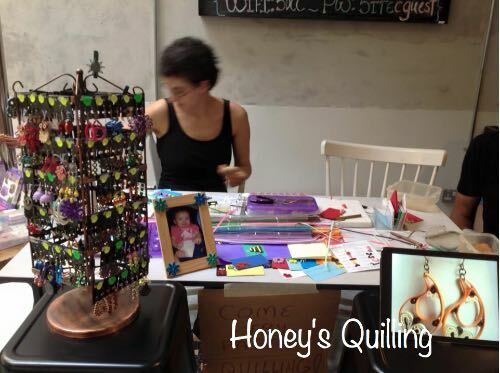 You can see my purple quilling box in the photo above. Svara and I each have one of these boxes from Quilled Creations, and they are so great for traveling! Because they are double sided they take up less room, and the compartments are perfect for paper, for tools, and then for little shapes that you make. You can find them on Amazon and at Custom Quilling. 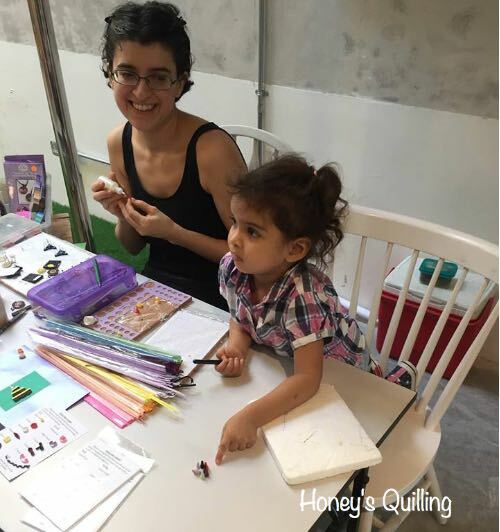 In the photo below Svara is teaching someone how to do paper quilling. Svara stayed around for awhile helping to teach, but when the table got too crowded she walked around and looked at all of the other booths instead. This is what our booth looked like most of the day! 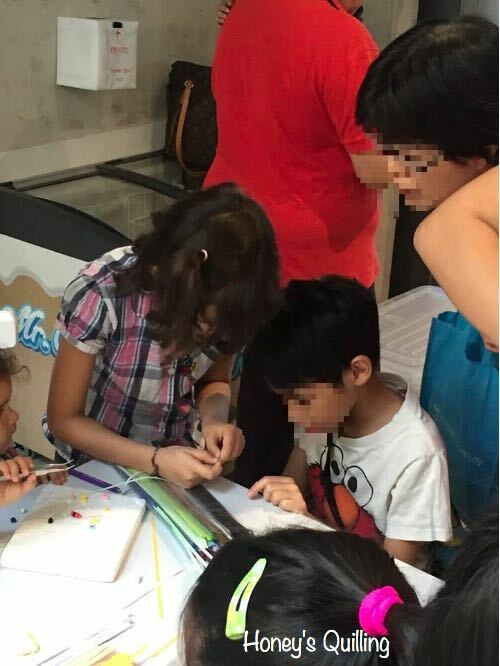 There were even a few girls who borrowed tools and went and did their projects on the side on the floor because there was no more room at the table! I was impressed with the patience of some of the kids. A few of them spent more than an hour at the table doing their projects! I used to have booths at craft fairs, but after I had Talisa I stopped, as it was just too much work to get everything packed up, worry about taking care of her on the day, etc. So it was fun getting out there again, and I prefer this type of event where the focus is on the learning, even though we could also sell our things. Stick around, there is lots more to see on the blog! Hi Honey.It was good to see you and Svara teaching other kids quilling.Keep up the good work and spread quilling. Yeah, it’s not easy to organize classes and such, so this was a great opportunity to share! Some of the parents asked about classes, so maybe in the next couple months I’ll try to organize a class at my home.